Vic Law makes a pass. The senior forward failed to score in double digits. Northwestern definitely isn’t one of the best offensive teams in the country. Coming into the game, the Wildcats were ranked 12th in the Big Ten in scoring with 69.3 points per game. 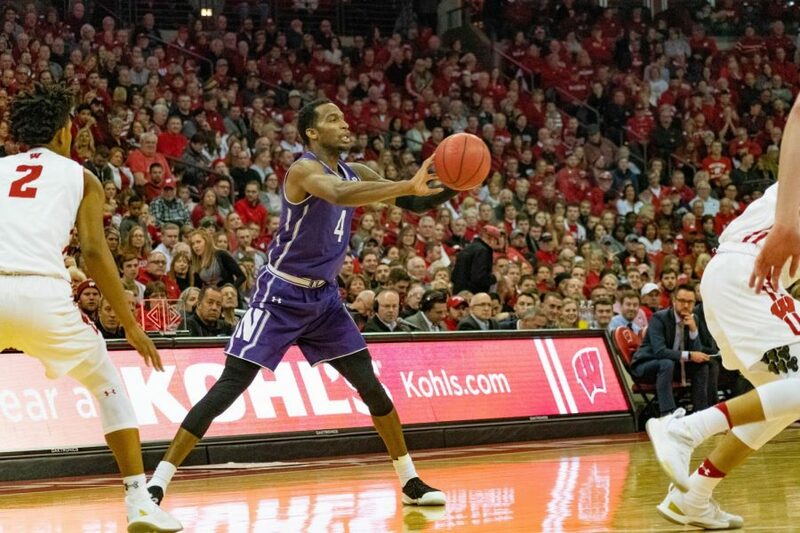 But despite being ranked near the bottom of the conference in scoring, not even the most pessimistic NU fan would have expected the Wildcats’ offense to play as poorly as it did Tuesday in a 70-52 loss to No. 21 Maryland (16-5, 7-3 Big Ten). NU (12-9, 3-7) shot 31 percent from the field and, without a couple of garbage time buckets from sophomore guard Anthony Gaines, could have easily had a percentage in the 20s. Gaines was about the only positive take away from the offense. Although he wasn’t particularly efficient, shooting 5-for-11 from the field, the 6-foot-4 guard scored a career-high 18 points. Gaines is slowly looking more comfortable being an offensive options. In his last seven games, Gaines has averaged 8.29 shots per game and has scored in double figures four times. The rest of the team hasn’t looked nearly as comfortable. Aside from Gaines, the Wildcats shot 27.8 percent as a team against the Terrapins. Nothing seemed to work as Maryland’s defense was stifling, forcing NU to take contested shots during the first half. In the second half, the Cats had more open shots, but just couldn’t convert. Unlike previous games, NU tried to establish senior center Dererk Pardon, but to no avail. Pardon was outmatched by Maryland’s big man duo of sophomore forward Bruno Fernando and freshman forward Jalen Smith, who limited him to 14 points on 5-for-14 shooting. Pardon was frequently double teamed and, when he passed ball back out, his teammates couldn’t hit from behind the arc. Senior Vic Law and graduate transfer Ryan Taylor combined to shoot a dreadful 2-for-10, while junior forward A.J. Turner [ didn’t score the whole game. The Cats came into the game shooting 34 percent, 10th in the Big Ten, and their percentage now stands at 33.4 percent. Despite this, NU averages 22.38 three point attempts per game. If the Cats want to make any sort of late-season push, they will have to find another efficient way to score that doesn’t involve three pointers.